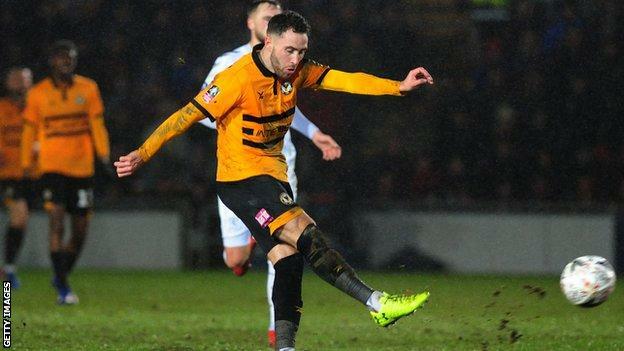 Newport County’s fantastic run in the FA Cup continued as they stunned Championship Middlesbrough to set up a fifth-round clash with Manchester City at Rodney Parade. The League Two side dominated their more illustrious opponents and were full value for the win, secured by second-half goals from Robbie Willmott and Padraig Amond. The prospect of the Premier League champions and Pep Guardiola visiting Newport is scarcely credible for a club that folded in 1989 and were within 90 seconds of dropping out of the Football League in 2017. County, who shocked Premier League Leicester in the third round, now stand to earn more than £1m from their FA Cup campaign, a potentially transformative figure for a club in the fourth tier. They have reached the fifth round for only the second time, and the first since 1949. Goalkeeper Joe Day had missed Newport’s past two matches as his wife was heavily pregnant with twins. With the birth apparently not imminent, Day was recalled to the side but returned to the dressing room at full-time to discover his wife had gone into labour and immediately rushed to hospital. The home players left behind soaked up the applause on a sodden surface, having knocked out a club 56 places above them in the Football League. Rodney Parade, with its packed terraces and uneven playing surface, has been a surprise factor against the likes of Leeds United, Tottenham Hotspur and Leicester in the past, but there was little prospect of Newport feeling unfamiliar to Middlesbrough manager Tony Pulis. He grew up in Pill on Dolphin Street, a stone’s throw from Baldwin Street, where Newport boss Michael Flynn is from. He also spent two years playing for his hometown club in the mid-1980s and was warmly received on his return. This was a special night for Newport and, based solely on performance, you would never have known which side was from League Two and which is fifth in the Championship and seeking promotion to the Premier League. Newport, who needed a 93rd-minute equaliser in the original game to force a replay, were outstanding in the first half. They had 11 attempts on goal compared to only two from Boro, who hit the outside of the post through Jordan Hugill. County were unlucky not to convert an almighty scramble on eight minutes with Mickey Demetriou and Amond both seeing shots blocked, while Amond’s looping header was also close. Newport thought they should have had a penalty when Boro midfielder Adam Clayton appeared to handle, but referee Stuart Atwell waved away the protests, before Dimi Konstantopoulos denied Amond from close range. Willmott’s brilliant run and cross then allowed Amond a free header, but it was straight at Konstantopoulos to cap a frustrating half. The hosts deserved a goal for their dominance and when Willmott, who was stacking shelves in a supermarket less than two years ago, raced clear and saw no obvious support, his speculative effort deceived Konstantopoulos and flew in from 20 yards. The expected fightback from Boro never materialised and County made the game safe with a well-worked second goal, Amond timing his run and firing home a Willmott corner in a move straight from the training ground. Middlesbrough had no answer to the Exiles’ dominance and now it is the over to the likes of Sergio Aguero and David Silva to work out the formula for beating Flynn’s men. Newport County boss Michael Flynn: “It’s nothing more than we deserved, tonight we were absolutely outstanding. We should have had a penalty and should have scored more than twice too. “At half-time I told them, ‘you are going to get another opportunity’. We had created too much not to get another one. We stuck to our game-plan. Boro changed their shape a few times, which shows how well we did. “Robbie Willmott was outstanding. An old-fashioned winger, he is very versatile, he’s an outstanding talent and he should have played higher in his career. Middlesbrough manager Tony Pulis: “They were the better team, they ran all over us. It was men against boys. Forget the conditions, you have to match people and that’s the real disappointment. “Give them credit, they were fantastic tonight and they deserve their win. The tempo of the game was really poor from us. I am desperately disappointed at the lack of real commitment. We were outfought and outplayed. Newport County are now unbeaten in their past five home FA Cup games against higher division opposition, winning four and drawing one. Since the start of the 2013-14 season, Robbie Willmott has had a hand in eight goals for Newport County in the FA Cup proper (four goals, five assists), at least three more than any other player. Tony Pulis has been eliminated from the FA Cup by a team from the fourth tier or below for the first time since his Bournemouth side lost 2-1 to Preston in January 1994. Second Half ends, Newport County 2, Middlesbrough 0. Attempt missed. Lewis Wing (Middlesbrough) right footed shot from outside the box is too high. Assisted by Rajiv van La Parra. Attempt blocked. Adam Clayton (Middlesbrough) left footed shot from outside the box is blocked. Assisted by Rudy Gestede. Attempt missed. Matthew Dolan (Newport County) left footed shot from outside the box misses to the right. Assisted by Scot Bennett. Substitution, Newport County. David Pipe replaces Robbie Willmott. Attempt blocked. Lewis Wing (Middlesbrough) right footed shot from outside the box is blocked. Assisted by Rajiv van La Parra. Attempt saved. Ashley Fletcher (Middlesbrough) left footed shot from the centre of the box is saved in the bottom left corner. Assisted by Rajiv van La Parra with a cross. Corner, Middlesbrough. Conceded by Mark O’Brien. Attempt blocked. Ashley Fletcher (Middlesbrough) left footed shot from a difficult angle on the left is blocked. Assisted by Rajiv van La Parra. Attempt blocked. Adam Clayton (Middlesbrough) right footed shot from outside the box is blocked. Assisted by Lewis Wing. Attempt blocked. Ashley Fletcher (Middlesbrough) right footed shot from outside the box is blocked. Assisted by Rudy Gestede. Attempt blocked. Rajiv van La Parra (Middlesbrough) right footed shot from outside the box is blocked. Assisted by Jonny Howson. Goal! Newport County 2, Middlesbrough 0. Padraig Amond (Newport County) right footed shot from the centre of the box to the top right corner. Assisted by Robbie Willmott following a corner. Corner, Newport County. Conceded by George Friend. Attempt blocked. Robbie Willmott (Newport County) right footed shot from outside the box is blocked. Assisted by Padraig Amond with a headed pass. Offside, Newport County. Jamille Matt tries a through ball, but Padraig Amond is caught offside. Offside, Middlesbrough. Adam Clayton tries a through ball, but Ashley Fletcher is caught offside. Substitution, Middlesbrough. Ashley Fletcher replaces Britt Assombalonga because of an injury. Offside, Middlesbrough. Adam Clayton tries a through ball, but Rudy Gestede is caught offside. Substitution, Middlesbrough. Rudy Gestede replaces Jordan Hugill because of an injury. Attempt missed. Lewis Wing (Middlesbrough) right footed shot from outside the box is too high. Attempt blocked. George Friend (Middlesbrough) right footed shot from the left side of the box is blocked. Attempt blocked. Britt Assombalonga (Middlesbrough) header from the centre of the box is blocked. Assisted by Adam Clayton. Goal! Newport County 1, Middlesbrough 0. Robbie Willmott (Newport County) right footed shot from outside the box to the bottom left corner. Assisted by Padraig Amond with a headed pass following a fast break. Substitution, Middlesbrough. Rajiv van La Parra replaces Paddy McNair. First Half ends, Newport County 0, Middlesbrough 0. Attempt missed. Mickey Demetriou (Newport County) header from a difficult angle on the left misses to the left. Assisted by Dan Butler with a cross following a corner.